The HP ProLiant ML30 Gen9 4-Bay LFF Tower Server makes for an easy server solution excellent for any IT Professional or SMB in need of performance, capacity, and a low cost to acquire. Simple and scalable the HP ProLiant ML30 Gen9 4-Bay LFF Tower Server offers a complete server for scaling up and versatility over time ideal for remote offices and branches. Capable of using the new ClearOS software, you can now with this generation of HP ProLiant ML30 build out a server that is perfectly fitted for your requirements with a lower initial up front cost. The HP ProLiant ML30 Gen9 is a single socket server with processors from the Intel Core i3 6th Generation and Intel Xeon E3-1200 families. These processors families feature data processing speeds of up to 3.6GHz, up to 8MB of cache, and core count of up to 4 Cores. Memory is also expandable up to 64GB of DDR4 2133Ghz RAM across 4 DIMM slots. 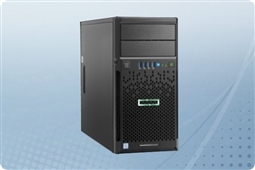 Also the HP ProLiant ML30 Gen9 is a 3.5” chassis with storage capacity of up to 32TB making it a great option for a small file servers or databases. Aventis Systems carries New condition in all 4-Bay LFF Tower Servers. All servers from Aventis System include a 3 year Comprehensive Warranty, with eligibility for optional Extended, Express, and Secure Drive Warranties as well as Onsite Services. So check out our 4-Bay 3.5” SAS and SATA product selection below and find the perfect versatile and simple HP ProLiant ML30 Gen9 4-Bay LFF Tower Server to make the most out of your budget today! 584GB (4 x 146GB) 15K 3Gb/s SAS 3.5"
Looking for the perfect HP ProLiant ML30 Gen9? Check out our Product Review: The HP ProLiant ML30 Gen9 Tower Server for how your business can benefit today!